First, please forgive any typos or nonsense I spout. I have an awful case of the flu. I should certainly be in bed sleeping–which I soon intend on doing, but first, I had to post this. It was just too funny not to. My kids’ school does an annual celebration of the 100th day of school where they have a party literally all day long (where was this when I was a kid???). Anyway, both boys were asked to wear 100 items on their clothes. 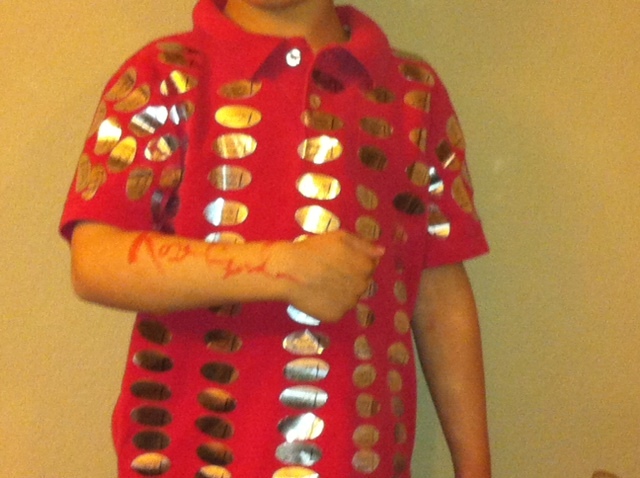 My oldest son wanted to wear 100 clothes pins. My younger son couldn’t decide what he wanted to wear, and just before bedtime I announced, then you’re not wearing anything on your clothes (it was optional). Of course, he got upset, but it was like 7pm and I didn’t have 100 of any other items. Then I looked to my right and had an aha moment. One that I honestly didn’t think he’d go for, but his excitement was uncontrollable, so I agreed. If you can’t see it very well, those are 100 “signed by the author” stickers all over his shirt, and then in washable marker, I signed my name. We all thought it was clever and fun, but then again, I do have the flu so it might not have been. At least he was excited, and that’s all I care about! So cute. We have never done the “Wear 100 things” but they always have to do something. This year my second grader had to hide 100 things in a bag and write clues for the class to guess what it was. We did the easy thing and did cereal. He took 100 Froot Loops. One year the Twins had to make a poster with 100 of their favorite things on it and one of them Pokemon and we used 100 Pokemon stickers and didn’t use the same one twice. We had an ultimate sticker book of them. It hung outside the classroom for a couple weeks and I noticed when I went in for their IEP meeting that kids had been taking the stickers off. His one the only one that had missing items on it. When he brought it home it was fun to look at to see which ones were missing. I wonder what the kids were doing with the stickers? Wearing them? Collecting them? I didn’t even think of cereal. The same son had to also find 100 things around the house and make something with it. A lot of the boys made something out of their legos or out of cotton balls. Mine went outside and gathered 100 walnuts from our backyard and glued them together to be a raft. Hoping you feel well soon. How sweet that your son is so proud of you that he will let you autograph him. Thanks, Judy. I am feeling much better now, actually. Wonderful idea! feel better soon! Thank you, Daniela! I thought it was pretty good, but was very relieved when he was on board for it. Otherwise, he’d have had to have gone as just him regular self! The tallies are great! I wish I’d thought of something like that. LOL Although, my kids have to wear collared shirts to school so I’m not sure how quickly I’d have taken a marker to such a nice shirt. LOL But I love the idea. Tried to rest, my body wasn’t overly thrilled with the fluids, I’m afraid. Getting better though–slowly. When MY son was in kindergarten, he made a poster on which he wrote “things” 100 times. There were 100 THINGS on the poster. It’s rare that I go to a garage sale, but when I do, I’ll ask how much they’re selling the garage for. Or the yard. Or what different sizes and styles does “Big” come in? I love it. Thats such a creative idea. What reaction did he gat from his class mates? So did he! And evidently so did everyone else at the school…who knew.